Rafa Benitez is perhaps fortunate that Jose Mourinho had a stuttering start to his stint at Real Madrid, otherwise he could have had to avoid a great deal of mud flung from the Spanish capital. And for good reason: Inter weren’t impressive – but then neither where they all that bad. It appeared it was just to be one of those nights for Inter. Benitez dropped the Dunga-esque lopsided 4-2-3-1 they showcased in the European Super Cup for a more conventional interpretation, with forward Goran Pandev replacing the shuttling Dejan Stankovic on the right. Coachless Bologna lined up in a 4-1-4-1 formation which went out to stifle Inter and obviously did so well. They had few attacks, mainly coming on the counter, and didn’t really test Inter’s new higher defensive line as Atletico Madrid had. After years of sitting very deep, Inter are pressing higher up the pitch and are facing the opposite problems of Liverpool after Benitez. Instead of constricting the space behind and between them, Inter are now having to worry about the space in front of them – which inevitably leaves space behind them. Although a defensive change is always going to have teething problems, a large part of what made Liverpool’s pressing work was the presence of sweeper-keeper Pepe Reina behind the defence – the type of playerÂ Benitez no longer has at his disposal. Julio Cesar is obviously a world-class goalkeeper and so cannot be replaced (especially since Massimo Moratti wants to balance the accounts), but is not the most mobile of keepers, potentially leaving a large gap behind the defence. Another issue is that pressing requires extremely fit players, yet Inter suffer from a problem plaguing most of the bigger Italian clubs: an aging squad. Benitez got around this at Liverpool by alternating between sitting and pressing, allowing his side to conserve energy for another attempt at hounding the opposition, but with an older squad at Inter he may find his team sitting more often than pressing. This is a good idea for maintaining a high fitness level, however it shortens the length of time the team can realistically score. The fact that McDonald Mariga started, and Phillipe Coutinho and Jonathan Ludovic Biabiany appeared as substitutes, suggests that Benitez may attempt to bleed in younger players to create a more energetic team. Mariga looked pretty good: he was the more attacking of the holding midfielders, playing as Lucas perhaps should have done under Benitez, although this attacking license could again be attributed to Bologna’s defensive stance. He was a real nuisance to Bolgona: tidy on the ball, drawing more fouls than any other player, a good tackler and appears to have mastered the art of the niggling foul (where he realises he can’t get the ball and makes a very minor foul so the team can reshape but it’s unreasonable to book him). There were some positional issues though: occasionally he would get drawn towards the ball, despite another player already putting the player under pressure, instead of staying goalside of his own man thus allowing this player time and space once he received the ball. Inter’s defensive and energy issues mainly don’t apply directly to this particular game though, as Bologna where happy to defend, as you would expect from a team who finished 17th last season and don’t have a coach. They came up with an interesting way of combating Inter’s movement (fig. 1) by forming a 5 man defence. Usually Diego Milito will drop deeper, hopefully drawing a defender with him, with Wesley Sneijder attacking the space he’s vacated. Alternatively, Samuel Eto’o could move into this space, with the right-back following, and giving Sneijder space to take advantage of on the left flank; it’s this sort of movement that killed off man-marking. 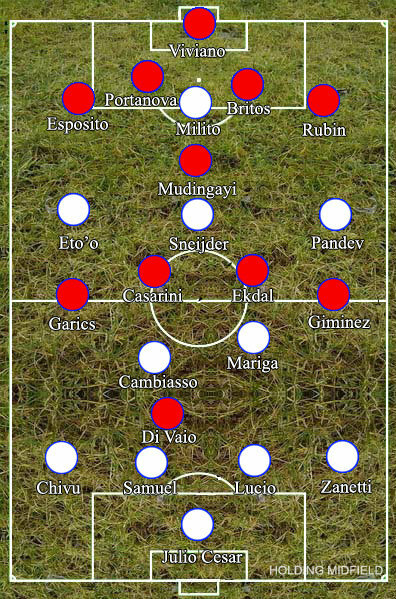 Instead, Eto’o moved into a striking position with Andrea Esposito in tow, only for Gyorgy Garics to drop into the right back position (fig. 2). 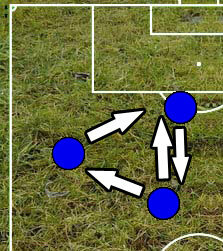 This ensured Bologna kept a one man advantage in the centre and denied Sneijder any space in his favourite area to drift into, so he gave up and popped up more on the right. fig. 2 – Heatmap of Gyorgy Garics, showing him dropping into the right-back position. Inter definitely missed Maicon; Christian Chivu is good on the ball but naturally a centre-back, while Javier Zanetti is 37 and it is unfair to expect him to bomb down the wing all game long. Maicon would have provided the width and forceful attacking that Inter needed to break down Bologna, they controlled possession but needed a more direct option. It’s most likely that Chivu and Maicon will be Benitez’s favoured pair, bearing in mind his use of passing and attacking full-backs at Liverpool, although where that leaves the talented young Davide Santon could be an issue. Sneijder was Inter’s biggest threat and took more than twice as many shots as any other player, attempting to give the more direct option that Inter needed, but ultimately did not do enough to score. Despite their good defending, it was recent (after this game) Italy debutant Emiliano Viviano, intriguingly co-owned by Inter, that kept Bologna in the game. It wasn’t a vintage Inter performance, but on another day they probably would have won comfortably.